Professor Jamie Hacker Hughes attends the opening of a new Science Museum exhibition. 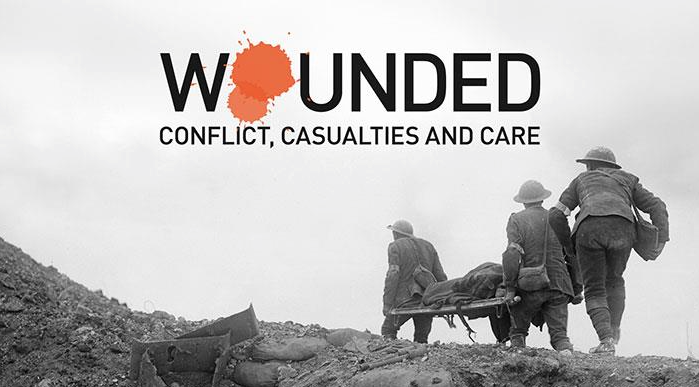 Opening 100 years after the beginning of the Battle of the Somme, when 57,000 soldiers were killed on the first day, the Science Museum is mounting a fascinating exhibition entitled ‘Wounded: Conflict, Casualties and Care’. Representing the British Psychological Society at the preview evening, I found that the exhibition covers protection (through luck, superstition, armour and equipment), first aid, life saving equipment and rehabilitation, with many examples of talismans and charms, armour, gas masks, first aid kits, stretchers, anaesthetic and surgical equipment, as well as many examples of early prosthetic legs and arms (officers’ and soldiers’ arms were, rather disturbingly, of different quality! ), and, one of the most grisly exhibits, a case full of glass eyes…. The opening of the exhibition by Science Museum Director, Ian Blatchford, and Chair of Trustees, Dame Mary Archer, included an inspirational speech by Falklands War veteran, Simon Weston, who spoke at length about the hidden wounds of war. He was accompanied by the singing of three beautiful songs - with words by A.E. Housman set to music by the composer George Butterworth who, as an officer in the Durham Light Infantry, was killed by a German sniper during the Battle of the Somme in the early hours of 25 August 1916. The tenor Roderick Williams was accompanied by Iain Burnside. Some 20 million people were left disabled, disfigured or traumatised by their experiences in World War 1 and it was on these 20 million wounded that the exhibition had as its focus. The exhibition was produced in association with the charities BLESMA (Limbless Veterans), Blind Veterans UK and Combat Stress (The Veterans Mental Health Charity). Thus, in addition to a focus on physical (including horrendous facial) injury there was a large emphasis on the psychological effects of war. Even by the end of 1918, 30,000 war pensions had already been awarded for ‘shell shock’. The figure continued to rise thereafter. For me, a highlight was a facsimile of the medical record of the document transferring the war poet, Lieutenant Wilfred Owen, for treatment at the Slateford Military Hospital at Craiglockart in Edinburgh (now the home of the main building of Edinburgh Napier University). Following treatment at Craiglockart, where he formed a close friendship with fellow officer, poet and author, Siegried Sassoon, Owen returned to the front to his unit, the 2nd Manchesters, where he was killed in action on 4 November 1918, almost one week to the hour to the signing of the Armistice. Many, like Sassoon, were comparatively lucky, in that they survived, intact, with their lives; many, many were treated with psychotherapy for ‘neurasthenia’, ‘shell shock’ and other ‘not yet diagnosed neurological’ disorders; some were ‘treated’, in fairly barbaric fashion using, for example, Lewis Yelland’s electrofaradism machine, also on display; but some, including the 306 who were shot at dawn, were perhaps the unluckiest of all. Posttraumatic stress, as we now term it, lives on. Thousands continue to suffer, and so the film and poetry by Combat Stress veterans, which closes the exhibition, was especially poignant. - Reviewed by Professor Jamie Hacker Hughes, Vice-President of the British Psychological Society. - The exhibition will run until 15 January 2018.